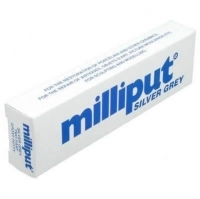 Milliput Silver Grey Epoxy Putty 113gThis is a two part putty weighing 113g.Silver Grey Milliput is a slightly finer filler and is widely used for model making, sculpting, taxidermy and for the repair of garden ornaments. Milliput features:Self hardeningNon – shrinkingTough and durableHighly adhesive to most materialsWater and chemical resistantSets under water and is electrically resistantmoulds like putty – sets rock hardIt is very important when using Milliput that you mix the two parts for at least five minutes.Mix together equal parts of each stick from the pack. Knead and roll in the hands for at least 5 minutes until the colours merge and become uniform and no streaks can be seen, and then mix for another minute. The surfaces to which the putty is applied should be free from grease and dirt. Smooth surfaces should be cleaned with a suitable solvent or with soap and warm water to remove dirt and grease. Abrading the surface will improve adhesion. The putty may now be applied and will set hard in three to four hours without shrinking. After setting hard Milliput continues to cure and is fully cured after over five hours at the same temperature. Once fully cured Milliput can be machined, drilled, tapped, turned, filed, sawn, sandpapered and painted. Milliput can be sandpapered and painted immediately it has set.